We already created one primary platform service controller ( PSC ) and when trying to install the second PSC\VC which connects to the primary PSC, it is failing with the error “ invalid credentials “ and the installation couldn’t accept to join the primary PSC domain. we tried to install by clearing the cache and also with different browser from the same local windows jump box server which primary PSC installed, even rebooted the server but still failed with the same invalid credentials error. We started checking the basic configuration like DNS forward and reverse lookup which was working fine and then the most interesting part is when we trying to connect to another different PSC which is located in different site, it accepts the credentials without any issue. At last installation went successfully when doing it from my laptop , it accepts the credentials without any issue and the installation got completed .Mostly the issue is because of the port issue For EX , from my laptop I was able to telnet port 636 to the primary PSC but from the jump box server in which the installation is failed the port was blocked.I am not very sure about which port have to be enabled but it is good to have the ports recommended on the below KB. In few other cases first check whether the primary PSC node is pinging and reachable because if it is unavailable also it will show the error as invalid credentials and also try by restarting all the service from the primary PSC node using service_control –stop\start. 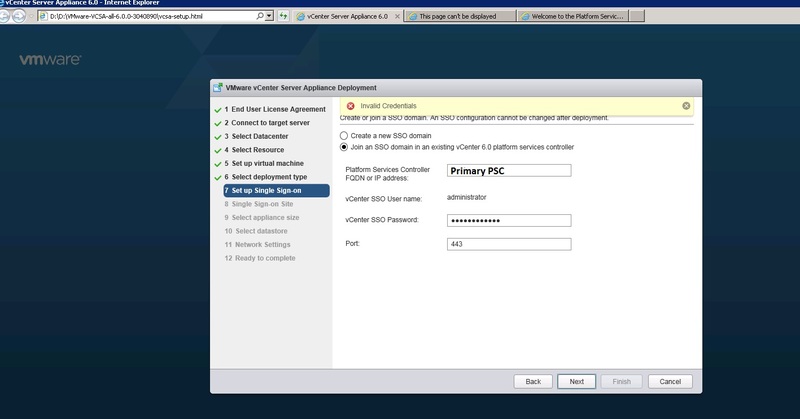 This entry was posted in vCSA 6.0, VMware and tagged Platform Services Controller issue with AD, VC6.0 Installation Issue, Vcenter Appliance Issue, vCSA 6.0, vCSA Issues. Bookmark the permalink. 1 Response to Invalid Credentials – Join an SSO domain in an existing vCenter 6.0 platform service controller.